Applications: Ideal for lighter duties on metal, such as cleaning and keying before coating. Can be used by hand or with orbital sanders. 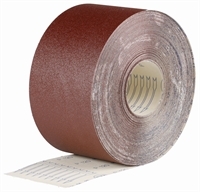 Product Notes: Particularly when working with metal, poor quality abrasive paper rolls do not last the distance. Which is why we have selected our KP949 F weight premium performance paper to be part of our web offering. KP949 is manufactured using a high purity aluminium oxide grit which means it keeps cutting long after most papers have become dull and with a heavy duty paper backing to ensure good lifetime and performance.